“If they die now, it just means they didn’t have what it takes to go any further.” Harsh they may be, truer words were never spoken. Despite her ice-cold demeanor and gloomy, threatening affectation, I have no doubt Ozen would be immensely disappointed if Riko and Reg died during their ten-day survival test. Now obviously they’re not going to die—and she probably knows that. There may be a lot of bugs when they use fire and a grumpy hippo-like beast who doesn’t want them near his water, but Riko and Reg make a great team, and they have, after all, lived and survived off the land up until now. Thus Ozen would be worried, even if she was capable of being worried about the two kids passing the test. Ozen takes us back to when Lyza introduced her to a frail-looking young man named Torka whom she married. In a classic Ozen move, she fast-forwards to after Torka has passed away from the effects of the Abyss, and Ozen has to deliver a stillborn Riko. 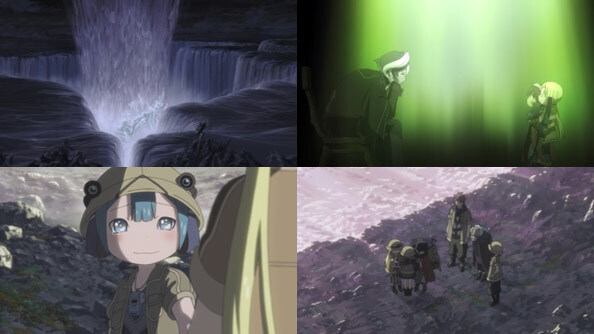 But as much of a ‘hassle’ as it was, Ozen remained faithful to her dear apprentice, who had progressed so far only to go through so much pain and anguish, and assures the suddenly-alive baby Riko of her “strong sense of duty” which continues to the present now that Lyza’s daughter has descended to her lair. The product of her duty returns, dirty and exhausted but very much alive after ten days. 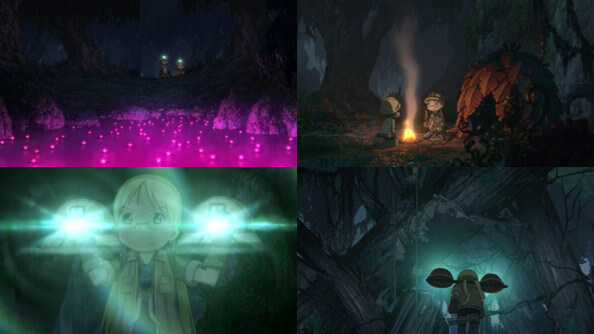 Reg points out it feels like more, and when Ozen invites them to sup with her, she tells them of how being in the Abyss warps one’s sense of time (among other parts of the brain), such that while Riko has lived ten years since coming up to the surface, to Lyza down in the netherworld it may have felt like a scant ten months; possibly even less. 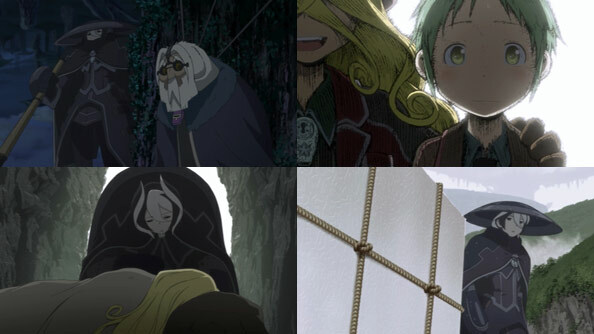 Needless to say, this is very heartening to Riko, but Ozen warns her and Reg to avoid the three White Whistles besides Lyza who are lurking in the lower layers as they speak, and when she says one of them isn’t “kind like I am”, you know she’s not joking: she, and everything we’ve seen of her, is still kinder than The Sovereign of Dawn, Bondrewd the Novel. I love the idea of White Whistles being their own tiny, elite tribe of eccentrics, and to think they get more eccentric (and less human) than Ozen is…a little unsettling. She’s also still not sure what to make of the note Riko thought was written by Lyza. After giving Riko her mother’s pickaxe, Blaze Reap, she sits her and Reg down and begins to tell them all of the things they’ll need to know as they continue their descent. These are secrets usually kept between White Whistles exclusively, but as Riko is the spawn of one and is headed to their realm, it only makes sense. It’s a sobering experience for Reg to hear of all the strange things on the lower layers, and Ozen doesn’t mince words. But Ozen isn’t trying to discourage them; only to prepare them as much as one can be prepared. 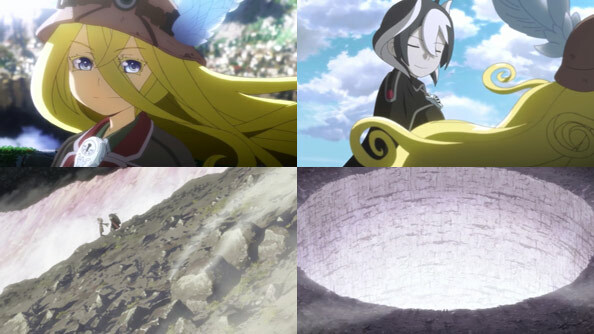 When it comes time to say goodbye, Ozen isn’t present, so Marulk and the raiders see off Riko and Reg. 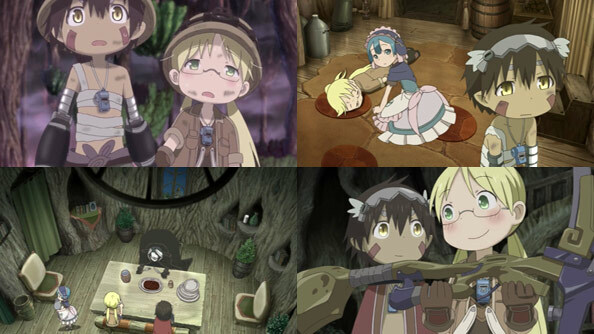 Marulk is particularly sad to see them go, and her tears not only cause Riko and Reg to tear up, but me as well! Ozen recalls one final pivotal exchange she had with Lyza after they returned to the surface. Lyza, whose face is finally fully revealed, has not only taken on an apprentice (Jiruo, AKA Leader), but has made the decision to make another descent in order to allow Riko to decide for herself what kind of life she’ll lead. She asks Ozen to tell Riko about all of the miracles that had to occur so she could live; Ozen agrees. Back in the present, with her duty now done, Riko and Reg set out for deeper depths approaching the terrifying sheer pale walls of the Great Fault and the Third Layer. While it seemed strange and alien at first, the longer we spent in the Inverted Forest, the more comfortable, even cozy it felt. The edge of the Fault couldn’t be any less hospitable. It will be exciting to see what other wondrous sights they’ll see in this newest setting—and what fresh devilry with which they’ll have to contend. All article and review text and infographics Copyright © MMXV RABUJOI. All other images, graphics and videos on this site are the property of their respective owners. Some material contains content not suitable for children or the sensitive. Reader discretion is advised. We reserve the right to cease watching or reviewing a show at any time, for any reason, without warning. Inappropriate and/or disrespectful comments will be deleted without reply. All article and review text and infographics Copyright © MMXVII RABUJOI. All other images, graphics and videos on this site are the property of their respective owners. Some material contains content not suitable for children or those sensitive to harsh language, violence and/or sexual content. Reader discretion is advised. We reserve the right to cease watching or reviewing a show at any time, for any reason, without warning. Inappropriate and/or disrespectful comments will be deleted without reply. RABUJOI – An Anime Blog Create a free website or blog at WordPress.com.